March 2019. 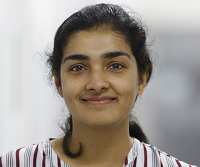 Rukmini Mukherjee was awarded one of the prestigious research fellowships from the Alexander von Humboldt Foundation, which enable postdoctoral researchers from abroad to pursue their next career step in Germany. Hereditary spastic paraplegia is a rare disease in which progressive spastic paralysis of the legs can already begin in childhood. The new Humboldt research fellow Dr. Rukmini Mukherjee wants to investigate the causes at the molecular level, which are still largely unknown. She came from India to join Ivan Dikic’s group at the Buchmann Institute of Molecular Life Sciences. Her research focuses on the family of reticulon proteins that are involved in the maintenance of the endoplasmic reticulum, an extensively branched tubular membrane system inside our cells. Many patients suffering from hereditary spastic paraplegia in Northern Europe and North America have mutations in the protein reticulon 2. Rukmini Mukherjee wants to find out what role these mutations play in the development of the disease. “We know from preliminary experiments that reticulon 2 interacts with many proteins that are not part of the endoplasmic reticulum. This indicates a unique role in the regulation of the structure of this cell organelle.” explains the young scientist. Identifying molecular targets involved in the disease process is the first step in the development of therapeutic drugs. So far, there is no treatment for the disease. Rukmini Mukherjee completed her PhD at the Saha Institute of Nuclear Physics in Kolkata, India, where she investigated how the small protein ubiquitin influences cell organelles, such as mitochondria or the endoplasmatic reticulum, during stress situations. "My interests fit perfectly to the focus of Prof. Ivan Dikic's lab. I was thrilled when I learned that I could continue my research as a postdoctoral fellow at Goethe University," explains the scientist.